I like action figures and I like Teenage Mutant Ninja Turtles. 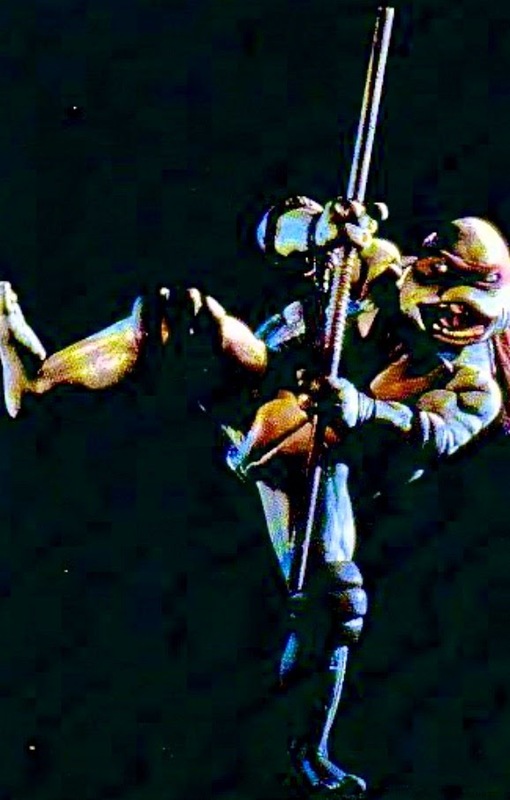 I also loved the 1990 TMNT movie when it came out. So when I was wasting time looking around the Internet I found this guy and I bought him before my wife could stop me. 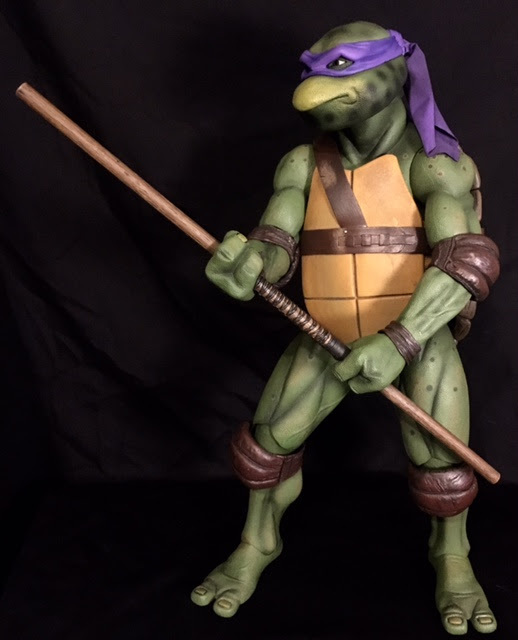 This is Donatello from the 1990 movie Teenage Mutant Ninja Turtles. 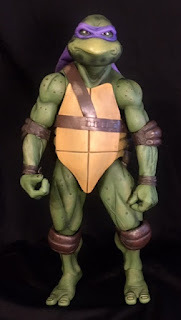 He is in 1/4 scale which means this figure is four times smaller than the actual costume. 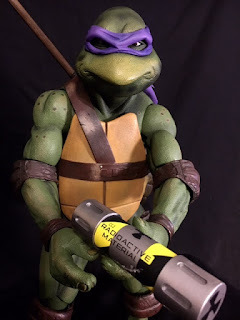 He came out in 2017 and was made by NECA, a company that has been making some wonderful action figures over the years. 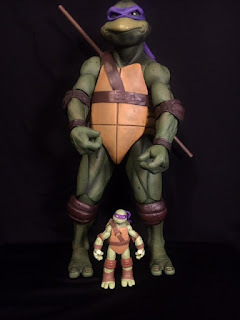 First impressions are that Donatello at 17 inches tall is huge. When you compare him to the regular scale TMNT figures Donatello looks like King Kong compared to them. The details on him are incredible to the point where the average person saw a picture of him it could easily be fooled to think it's a picture from the movie. 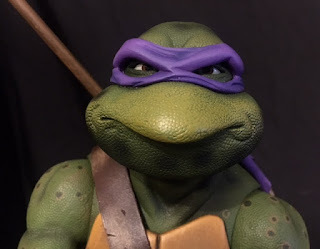 This line has all four of the turtles out now but by the end of the year, they are releasing a Raphael that comes with his trench coat and fedora which is the version of Raphael I'll be buying. 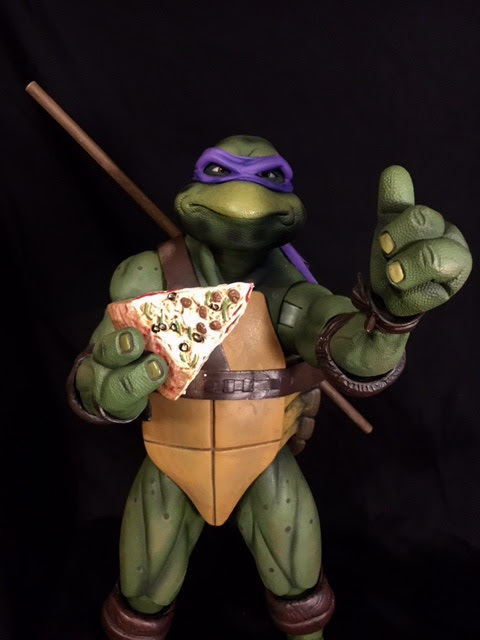 From what I understand in 2018 NECA will be releasing a Foot Soldier and The Shredder to the line which I'm looking forward to. A Casey Jones would be pretty cool too. 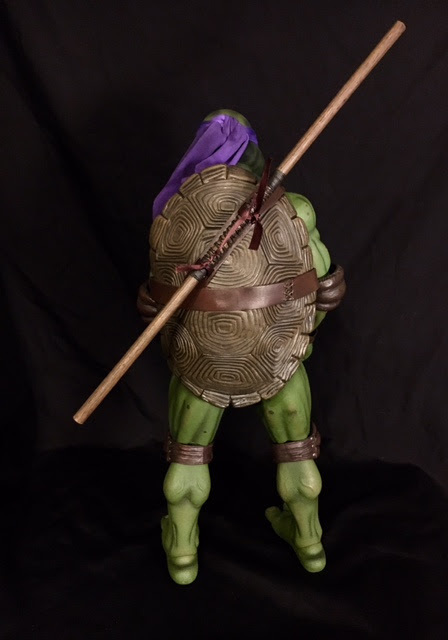 For accessories Donatello comes with his bo staff, a total of seven different hands, a canister of ooze, and a slice of pizza. The different sets of hands give you a lot of options including the ability of hold all of his accessories. I would have liked him to come with a different head sculpt but I'll take about that below. I have two problems with this action figure, the first being his limited movement. Don't get me wrong he is great and has all kinds of articulation, 30 points to be exact. 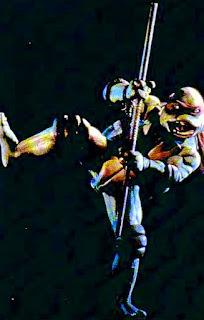 What this boils down to is he has some limited movement because he's a turtle. The front shell part restricts movement for the waist, legs, and arms. It's not terrible but it is there. Also, most of the movement points are really strong, strong enough to make me afraid to continue moving the parts as I can't tell if it's just the joint being stiff or if it's resisting because he's at the limit of its movements. The last thing I want to do is break him. The worst is his legs, they are so beefy that I feel they can move the way I want him to but I'm too nervous. The only other point of contention is his facial expression. 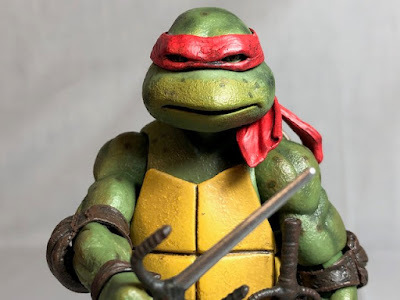 Donatello was a fun loving turtle in the movies and cartoons but his face for this figure has him with a scowl. He does make this face in some of the movie but in my opinion, he should have a grin. 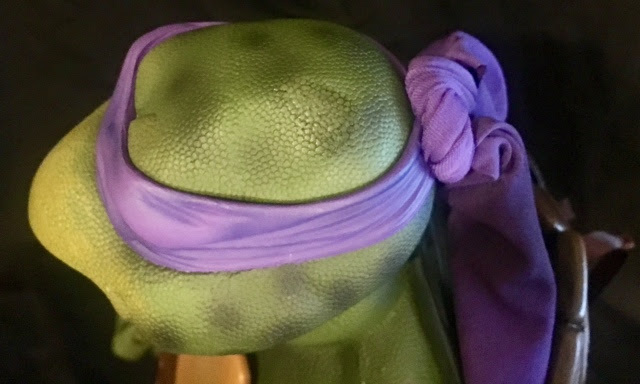 One other very minor issue is the straps on his shell to hold his staff in. They are movie accurate and look great but they come apart a bit too easily and so you'll have to be careful when you attach his staff to his shell. Donatello is big, heavy, and pretty solid when you pose him. Unfortunately for me, I had him fall off a desk onto a carpeted floor. It scraped away the paint on a part of his head. The green color was still in place as was the scale like texture but the black shading was missing. My wife barely noticed it and thought it would be fine but it was drawing me crazy so I gave the spot two washes of black ink and while it's not perfect it's good enough for me. I found this picture of Donatello from the first movie. He's in a crazy pose and thought it would be perfect to try and emulate. As you can see he turned out pretty well. Overall I'm extremely pleased with this 1/4 scale 1990 movie Donatello. He looks exactly how he did in the movie, has lots of articulation allowing you to pose him in many different and lifelike poses. He costs around 100 dollars and that is a great deal for what you're getting. 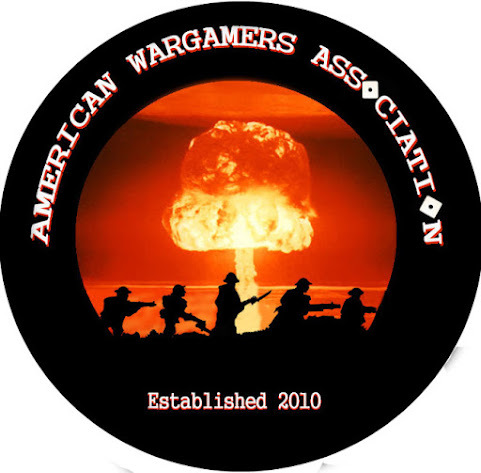 I'm looking forward to obtaining the rest of this line. 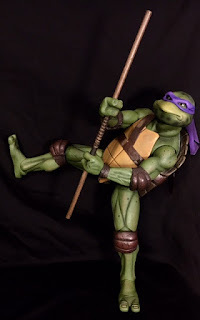 I give this Donatello 1990 movie action figure a 9 out of 10.